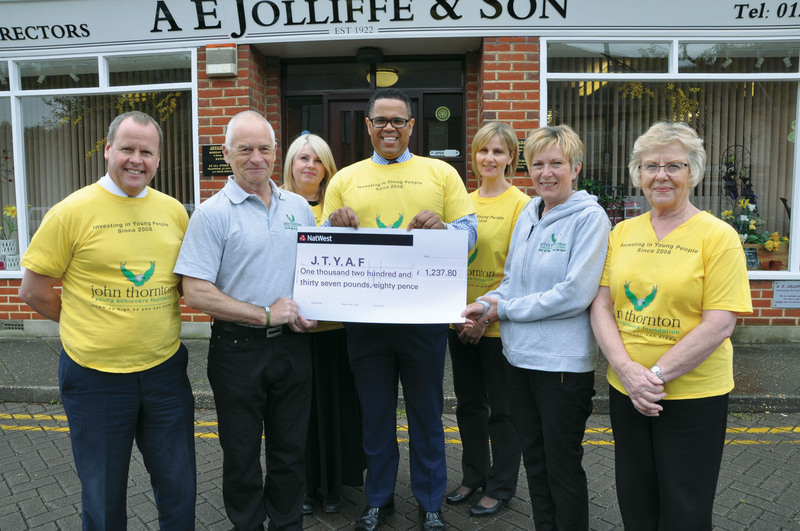 The John Thornton Young Achievers’ Foundation has been presented with a cheque for more than £1,200 by Dorset’s Douch Family Funeral Directors. More than a dozen staff trekked 30 miles in a sponsored walk to raise funds for the charity set up by the parents of Royal Marine John Thornton. He was killed in Afghanistan in 2008 and the foundation supports young people and youth organisations in Dorset. It funds scholarships for young people to aid their personal development and to assist them in the pursuit of their ambitions. The sponsored walk was completed in two stages and the 30 mile figure was significant as it marked what would have been John Thornton’s 30th birthday. The foundation is run by John’s parents, Pete and Linda, and has given out more than £330,000. It was set up from their home in Ferndown shortly after the death of their youngest son age 22. Douch Family Funeral Directors branch AE Jolliffe & Son arranged the funeral for John and his parents picked up the cheque for £1,237.80 from staff there. Pete Thornton said: “We are grateful and overwhelmed by this contribution and the amount raised. Nick Douch, MD of the funeral group, said: “We are committed to raising money for local charities and this cause is very close to us. “There were 13 of us in total doing the 30 miles over two weekends and people were extremely generous. “On the first stage we walked the Castleman Trailway from Ringwood to Upton House and we then went from Wareham Quay to Sturminster Marshall. Lt John ‘JT’ Thornton was tragically killed whilst serving with the Royal Marines in southern Afghanistan on 30th March 2008.